Kampala, Uganda — In the early 1990s, Uganda was ravaged by the AIDS epidemic. In some regions, infection rates were as high as 30 percent. Any Ugandan who survived that onslaught is still shocked at its magnitude. James Kigozi, a Uganda AIDS Commission official, describes that time. "It was really bad. I remember during that time I was still at the university. There was a time when you couldn't actually do any work. You could bury two, three, four people in a day, all of them known to you," says Kigozi. Silimu, or "slim," is Ugandan slang for HIV, so called for the facial wasting that can accompany the virus. AIDS in Uganda destroyed an entire generation, orphaned more than two million children and left fields, schoolrooms and offices untended. "There was a lot of strain on the medical services," says Kigozi. "People with other problems couldn't access them, you know? There was a lot of money being spent on HIV/AIDS-related issues. So many man-hours would be lost. You'd enter offices and you'd find half the labor force absent." In the face of this enormous tragedy, Uganda has turned the tide. It's now one of the developing world's few success stories in fighting AIDS. It's gone from having the world's highest HIV infection rate in 1991, to one estimated today at less than 7 percent -- still dangerous, but far more manageable. One unfortunate reason behind the sharp drop in infection rates is the sheer destructive force of the virus. There were so many deaths due to AIDS that the virus essentially burned itself out, leaving too few people to keep it spreading. Yet there's much more to this story. Philly Bongoley Lutaaya was an icon of Ugandan music, and with his song titled "Alone," he changed the face of the AIDS fight in Uganda, even changed the country itself. Lutaaya publicly announced that he was HIV-positive just before releasing "Alone," a song that shared his pain and loneliness in living with the virus. When Philly Lutaaya released "Alone," he set a precedent for arts-based health activism that's still going on in Uganda. "Philly Lutaaya gave a human face to living with AIDS. He made it seem as if it was not a monstrous thing," says Joel Isabirye, a Ugandan music historian. "So from that point, I would say music became effective from Philly Lutaaya in Uganda, in dealing with stigmatization." Many successful HIV awareness and support groups use music to attract their audience and deliver their message, but stigmatization and fear remain major stumbling blocks. While most health education songs strive to break down stigma, some songs end up exacerbating the isolation of those living with HIV. One song's lyrics are, "Let me run away from you, run away from AIDS," and "Do not touch me, go away, take away your AIDS." The AIDS Support Organization, or TASO, is world-renowned for its success. TASO offers it all -- counseling, HIV screening, medical support, community outreach and education. The organization also has offices in nearly every urban center in Uganda. "Music has played a significant role in TASO community mobilization and AIDS education," says TASO official Anne Kadumkasa. "Culturally, Ugandans love entertainment, they love dancing, they love listening to music, they love listening to the drums. So it has been a way of attracting people, entertaining them and at the same time, educating them." TASO drama group members, although HIV-positive, are generally in good health, and are supported through counseling and medical monitoring. And they're a surprise for audiences who've never seen healthy and happy people living with the virus. "The drama groups are very, very instrumental in breaking the ice between the community and the people that are HIV infected," says Kadumkasa. "So the community out there listens to them and watches them looking as healthy as they are, then starts to look at themselves, and later on go for HIV screening, and some of them do find they're HIV infected." Following Philly Lutaaya's lead, the TASO songs are educational, but also honest and emotional. TASO drama groups make an impact when they perform, but it's not limited to their audiences. Practice sessions become group therapy sessions for the drama group members. "When you come here, you joy, you sing, you dance," says Mahmoud Kayiwa, a member of TASO's drama group in Kampala. "You forget all about the disease. You start singing, you rejoice, you cannot get scared as you, when you are alone at home." TASO drama group meetings all start with the same song, Philly Lutaaya's "Alone" -- a pop song that helped transform a nation and gave a human face to a terrible disease. We've looked at the ways that music provides health education and therapy around East Africa. We've listened to choirs in Malawi singing passionately in the face of death; also the modern poetry of Tanzania in Swahili hip-hop. 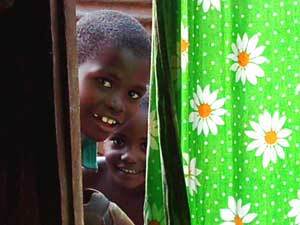 In Kenya, it was the forgotten voices of orphans living with HIV. We've learned that a single song has the power to lead an entire nation, Uganda, on a path of transformation. In these countries and across sub-Saharan Africa, music is a crucial element of HIV prevention. Music, though, is not enough. Gender inequality continues to spread the virus. Governments burdened with mountains of debt have limited resources for social services and prevention efforts. International aid in some cases has to filter through corrupt organizations. But the real tragedy of the HIV pandemic is that every death is preventable. With antiretroviral therapy, people with HIV in sub-Saharan Africa can live longer, healthier lives. HIV could be a chronic condition, managed in much the same way as diabetes. But until treatment is readily available, residents at the heart of this epidemic have no choice but to fight with the tools at hand -- their voices joined in song.